On a construction site, a scaffold might just be one of the most important tools that are used on the job, but does that mean you need to own one? The costs of this device means that individuals might want to weigh the pros and cons of hiring scaffolding before they make the decision to invest in a product of their own; after all, they could end up saving a small fortune and having the advantage of using a high quality item during the construction project. When it comes to hiring scaffolding, individuals have the opportunity to invest in a higher quality product without worrying about spending a fortune for the privilege. Just because you are not purchasing the item, this doesn't mean that you can't be picky with the one that you decide to get your hands on. If you are going to be saving on hiring the item, rather than making a purchase, why not opt for something of a higher quality? If you intend on using a scaffold regularly, you will need to ensure that you keep up with the maintenance of the item, or you could quickly end up with a product that belongs in the garbage. By hiring scaffolding instead of making a purchase, you won't have to worry about fixing up a device that is falling into disrepair, or even replacing one that is no longer reliable, and due to the costs of the higher quality options on the market, this could end up saving you a small fortune in the long run. 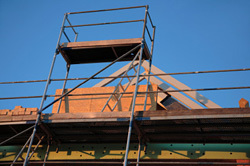 Professionals or DIY enthusiasts do not always require a scaffold to get a job done; in many instances, a simple ladder will do the job; for this reason, hiring scaffolding might be a good idea, especially since the item won't be in use long enough for the professional to get their money's worth. The last thing you will want to do is make use of the item once or twice before having to replace it again; this makes the hiring option very appealing. In instances where individuals need to erect a very unique scaffold, they might want to hire this device, especially since it might not come in handy again in the future. Professionals working in these situations can always have their scaffolding erected for them, before completing the job and having the device picked up. Professionals who are interested in hiring scaffolding from companies that specialise in these items will usually be able to benefit from the regular inspections and up-to-date maintenance that goes into the products, and this means that the results are more than reliable. Those that are looking to get the job done well without having to worry about the integrity of the scaffolding might want to look into this option to determine whether it would be best for them.